Mobile payments are finally taking off right now. But it is not mobile wallets for consumers with NFC-chipped mobile phones leading the way. It is payment apps for small merchants like those made by Square and Intuit’s GoPayment. 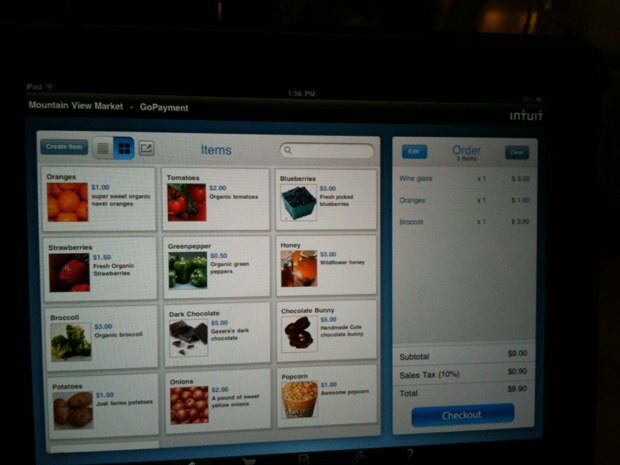 Tonight at an Intuit showcase in New York City, I got a sneak peak at several new Intuit products still in development, including an upcoming GoPayment tablet app that aims to replace the cash register for small businesses, Intuit 401k, and an iPad Check-in app for doctor’s offices. The GoPayment app will work on both the iPad and Android tablets In addition to taking credit card payments with a swiper that plugs into the headphone jack, it also lets merchants set up a cash register with their own products and prices. They can even take pictures of the products with their iPad 2 and the picture is placed on a virtual button to make it easy for any employee to ring up the items. It will also have the ability to take pictures of checks and deposit them from the image. Square, of course, has its own iPad app which has been available for almost a year. Add a cash drawer, and these systems can readily replace a register that can cost thousands of dollars. All a merchant needs is an iPad and the software. Intuit and Square still make a tiny fraction off each transaction, but they get rid of much of the equipment, and all the maintenance, costs associated with typical credit card readers you find in most stores. GoPayment has been around for two years, but only recently started to target the lower end of the market where Square is gaining traction—small businesses without merchant accounts at banks who don’t already take credit cards. Another competitor, VeriFone, is making noise in an attempt to enter this market as well, but Square should be more concerned about Intuit. The company already has relationships with 4.5 million businesses through QuickBooks and has a few advantages in payments processing. The trick to making money in payments processing is to keep the fraud rate down. Intuit already handles payments for many small businesses through and has built up an expertise in fraud detection to the point where it transfer money to its payments customers in a matter of two or three days. Square reduces its risk for larger accounts by holding the money for 30 days. Intuit’s credit card swiper might be uglier than Square’s, but don’t underestimate how important it is for small businesses to get getting paid faster. Both services seem to be neck and neck in terms of the volume of payments that go through each. GoPayment processes about $9 million a week, whereas Square is processing about $7 million (but GoPayment’s numbers include payments from the Web and QuickBooks, not just mobile). GoPayment has processed $113 million since it launched in 2009. Intuit’s director of mobile strategies, Omar Green, who happens to live in the same building in San Francisco as Square founder Jack Dorsey, acknowledges that Square led the way in opening up this new market. But it’s a wide open field and Intuit is going after the opportunity just as aggressively. Update: Intuit says it is now up to $12 million a week in payment volume and $120 million cumulative GoPayments. The other iPad app I saw is being developed by Intuit Health, which already offers health portals for doctor’s offices to help manage appointments and billing. Now it is working on an iPad Check-In app which will replace the paper forms on the clipboard you have to fill out every time you visit the doctor. Instead, you just sign in with your name and password, and fill out any necessary details on the iPad app. It also ties into payments and will allow patients to charge their co-pays electronically.